Oh my goodness are the first words that came to mind when I saw the pictures from this styled shoot. The colors, oh the colors! Absolutely amazing! 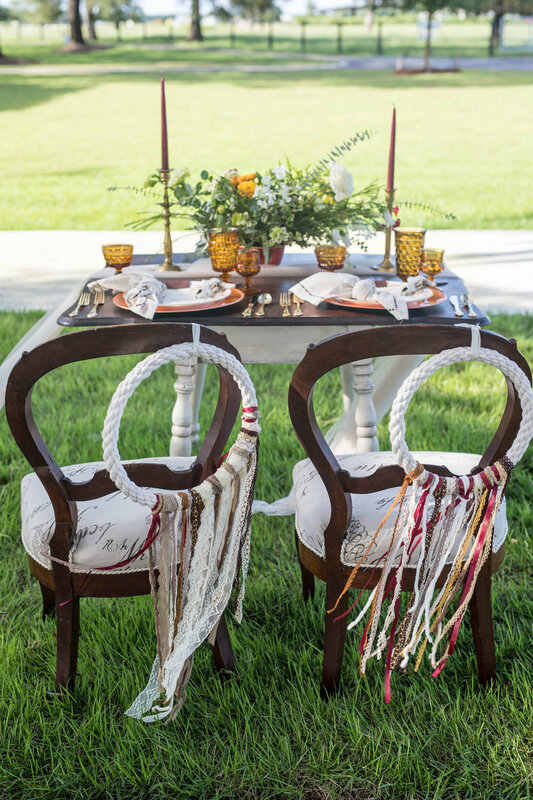 The theme was “garden boho chic” and the vendors from this shoot slayed it! The Palencia Club in beautiful St. Augustine, Florida was the perfect venue for this wedding shoot. The grounds for the Palencia Club are stunning and set the back drop perfectly. If you haven’t checked out this venue yet, put it on your list! It is a real gem in St. Augustine. Kari from Wedding Design by Kari brought in the most incredible florals! She chose blooms in shades of peach, pink, orange, and fuschia. A beautiful centerpiece of florals were laid across the farm house table provided by West and Lee Vintage Rentals. The Starfish Cottage Cakes used the new trend in cakes, an upside down cake! It was a show stopper for sure! 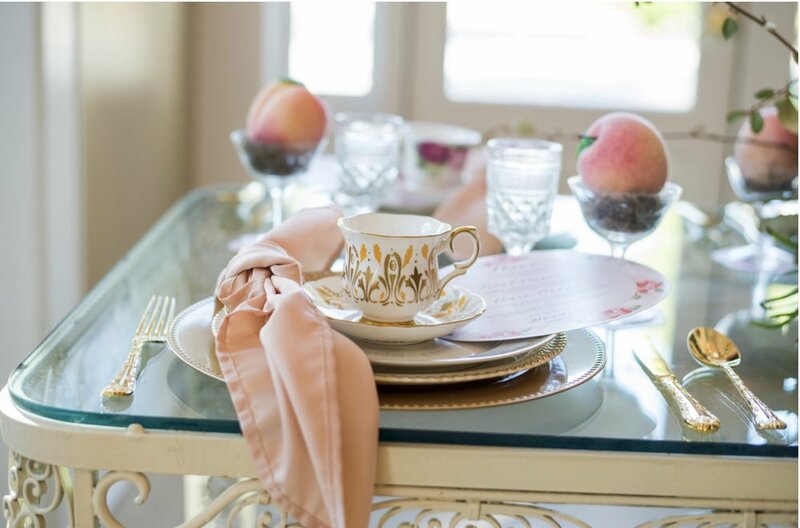 I set the table with glass chargers, white with gold rimmed china plates, miss matched gold flatware, blush and amber goblets, and for added detail I included salt and pepper cellars. 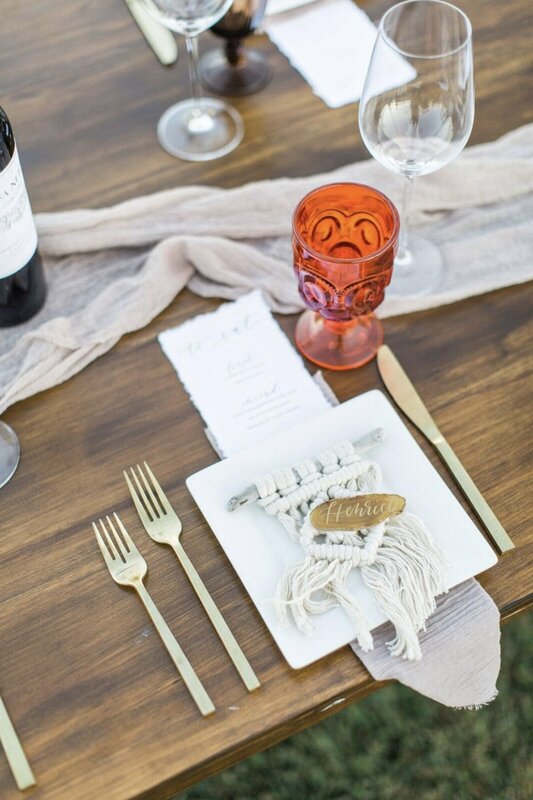 The place settings were subtle with just a little pop of color. I didn’t want the settings to be over whelming in color since the florals were so bold and bright. If you’re thinking about a garden theme wedding then you must take a look at these beautiful pictures from this shoot. The wedding vendors from this shoot are from Jacksonville, Orlando, and Amelia Island Florida. All vendors would be happy to help you create the wedding of your dreams. I fell in love with my vintage teacart as soon as I laid my eyes on it! I was out doing my usual rounds of thrift shopping in Amelia Island when I spotted it. I didn't ponder long on whether to buy it or not. Envisioning all the uses for it made it an easy to decision to mark it sold and load it in my truck. A teacart can be easily transformed into an awesome cigar bar/scotch bar. 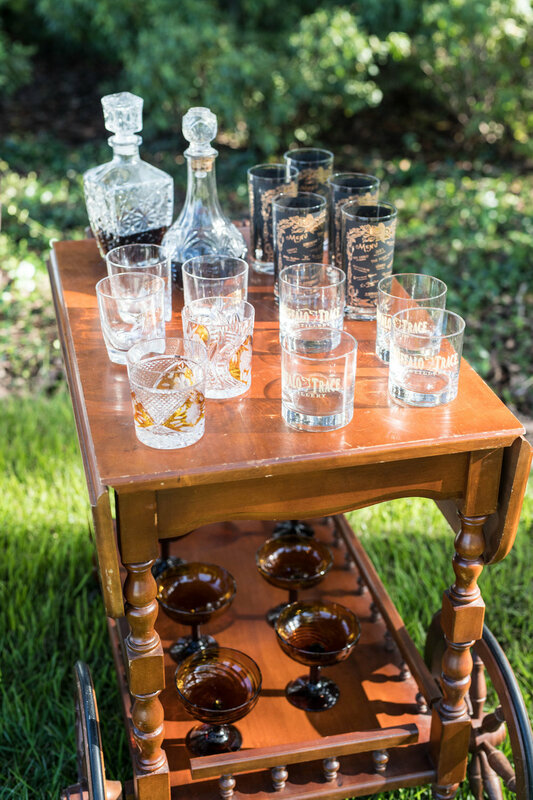 Set out vintage decanters, mismatched vintage barware, cigars, pipes, and some good Bourbon and Scotch and voila' instant bar for the men! Put out a few comfy chairs around the cart and the men will never leave it's side! 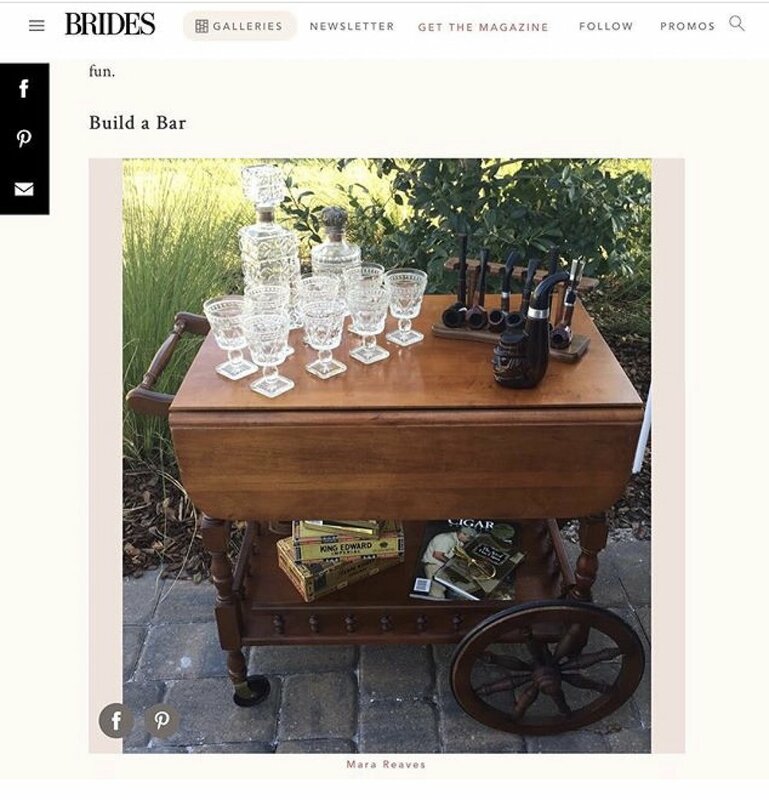 Brides magazine did an online article about Brodals (man version of a bridal/baby shower) one idea they had was to set build a bar and my teacart turned bar was the featured picture! Having coffee at your wedding or party? 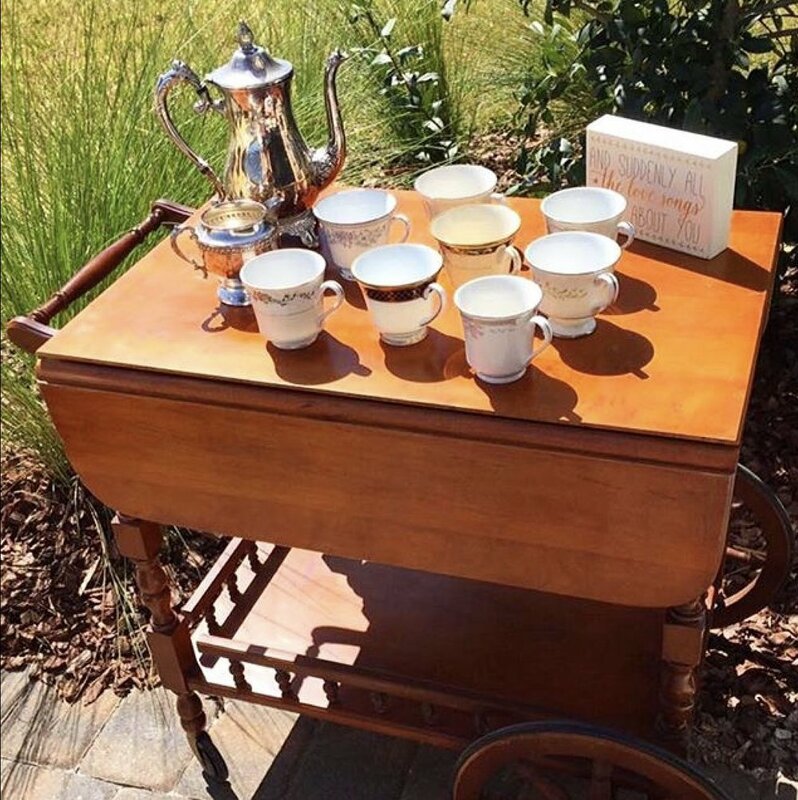 Use a teacart as a coffee cart. Set out lovely coffee cups and vintage coffee pots to create a beautiful coffee station. The coffee station can be dressed up with fresh flowers. Need a cake serving station? A vintage teacart would be perfect! It's just large enough to hold a cake and lots of beautiful vintage cake plates. Pinterest is full of ideas on how to dress up your teacart cake station. Teacarts can be used for many other things. They would be great for dessert stations, candy buffets, present stations, and for displaying photos of the bride and groom. The ideas are endless and Pinterest is full of them. 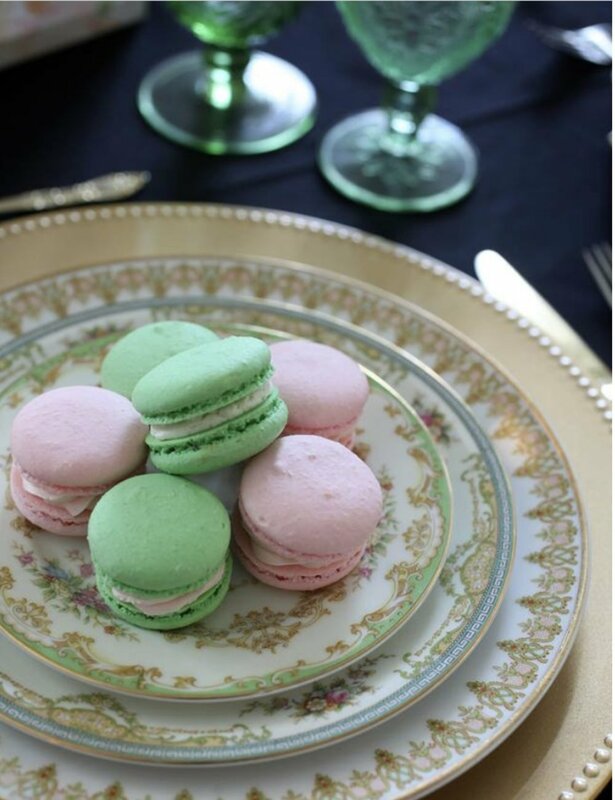 Think a teacart is something you need for your wedding or party? Contact me about renting mine! 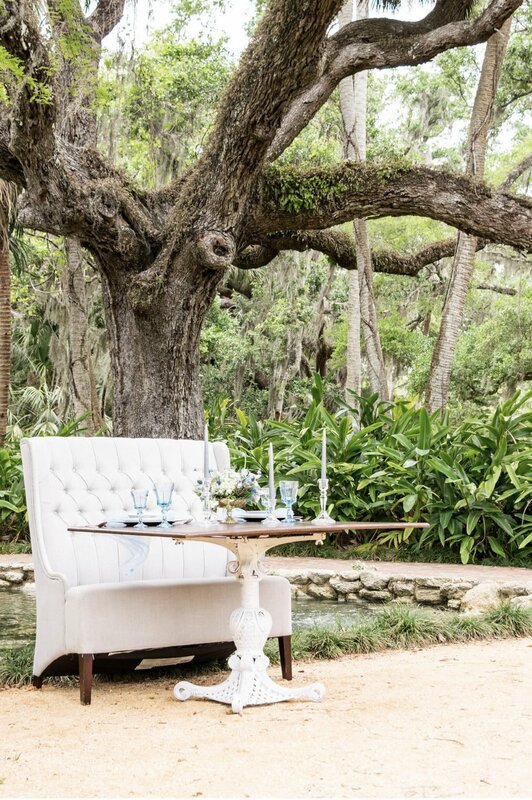 Washing Oaks State Park and Gardens in Palm Coast, Florida made for the most incredible location for a styled shoot! 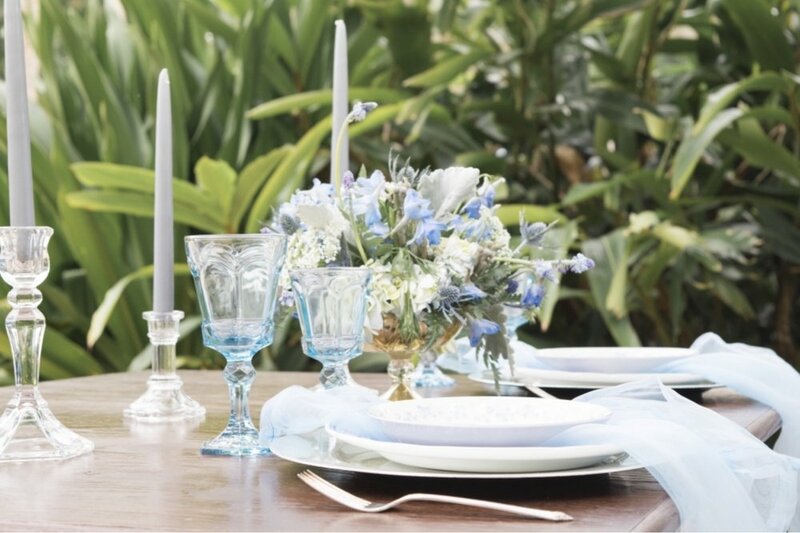 The theme for the shoot was a romantic table for two. 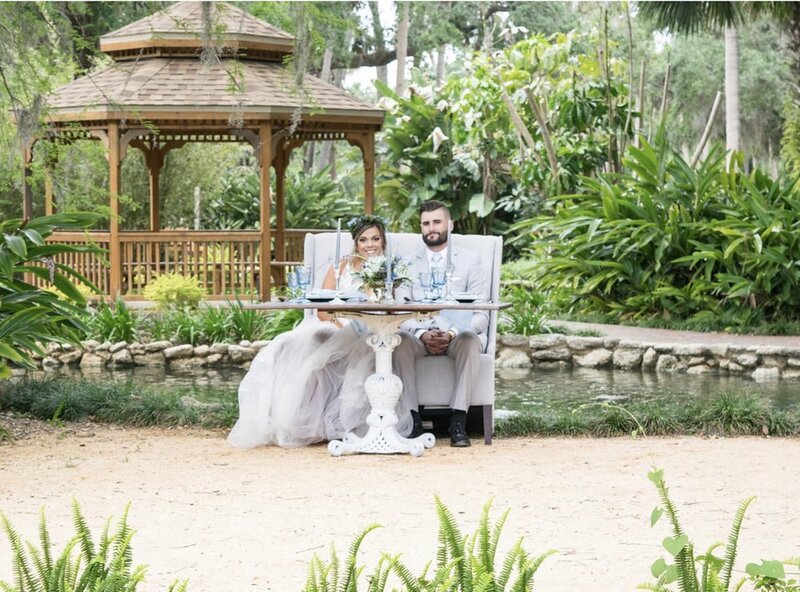 The huge trees, arbor, and a water feature set the backdrop for the sweetheart table set up. Several wedding vendors from around the Jacksonville and Amelia Island area all came together to create this shoot. 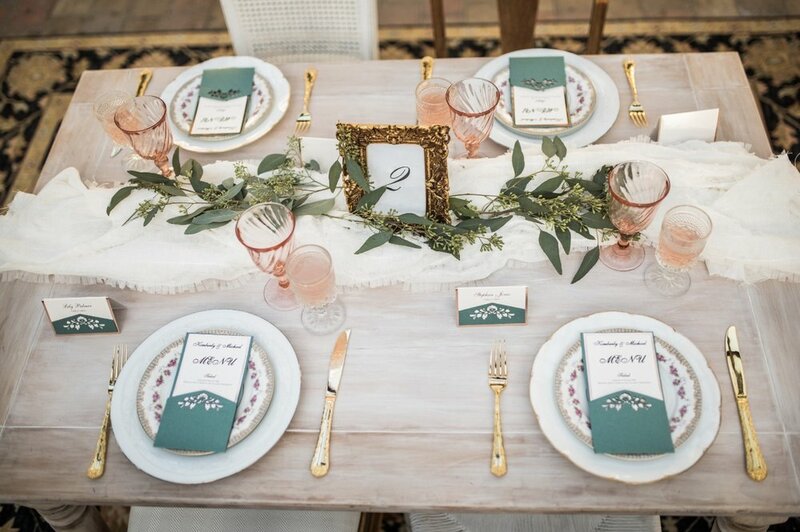 Events and More Decor by Carla brought the oh so romantic table and settee. Fern and Curl Florists provided the most perfect centerpiece for the table. Yours truly, Dish It Out brought out my blue and white vintage china, light blue goblets, silver chargers, and silver flatware. The blues and silver looked incredible together! I’m loving how blue and silver look on a dark wood table. If you’re looking for some outdoor wedding and sweetheart table inspiration then take a look through the photos from this shoot. The sun wasn’t shining and it was an unusually cold and windy day in South Georgia. 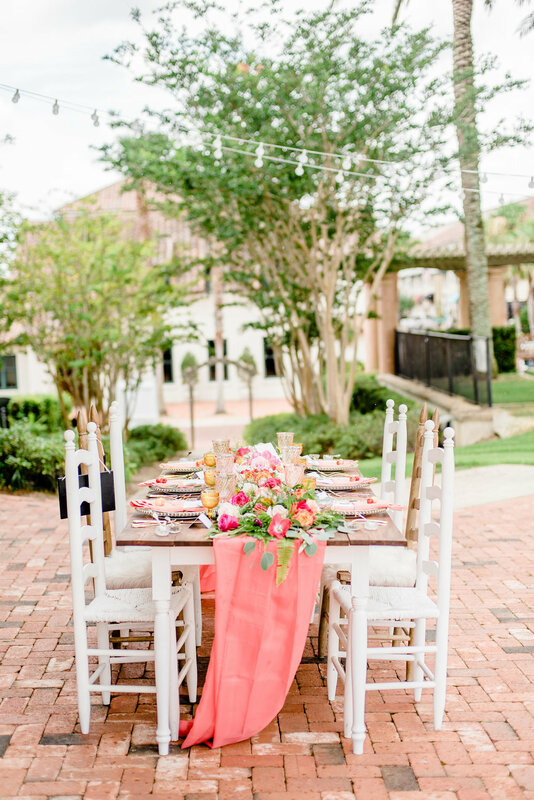 But, that didn’t stop an amazing group of Jacksonville and Amelia Island wedding vendors from creating a beautiful and oh so romantic styled shoot. Destiny (Let Destiny Design Flowers) and I had quite the time setting the table. 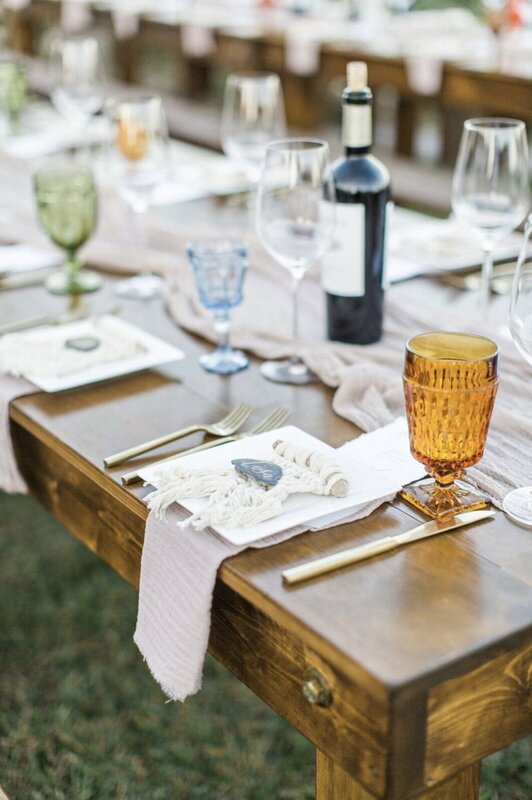 The wind just wasn’t wanting to cooperate, and so we loaded the table with gorgeous bottles full of spring blooms. 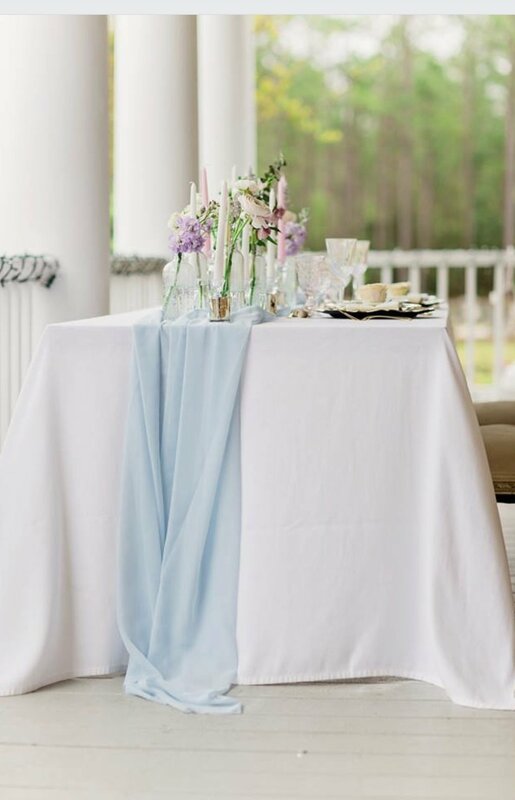 A perfect idea for holding down a table cloth and adding in more of the hues of pink and lilac. We scattered in a mix of white and soft pink candles in glass candle holders. Every romantic table setting needs candles! 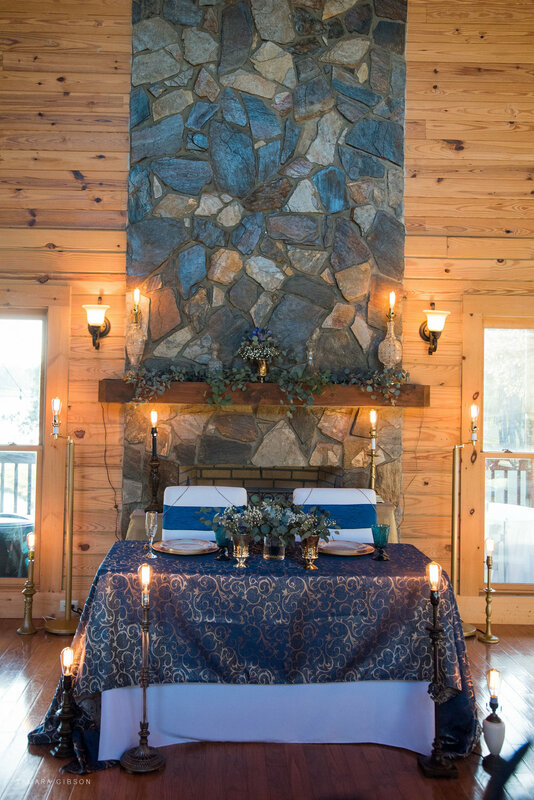 I love the use of candles in the same hues of the table decor. 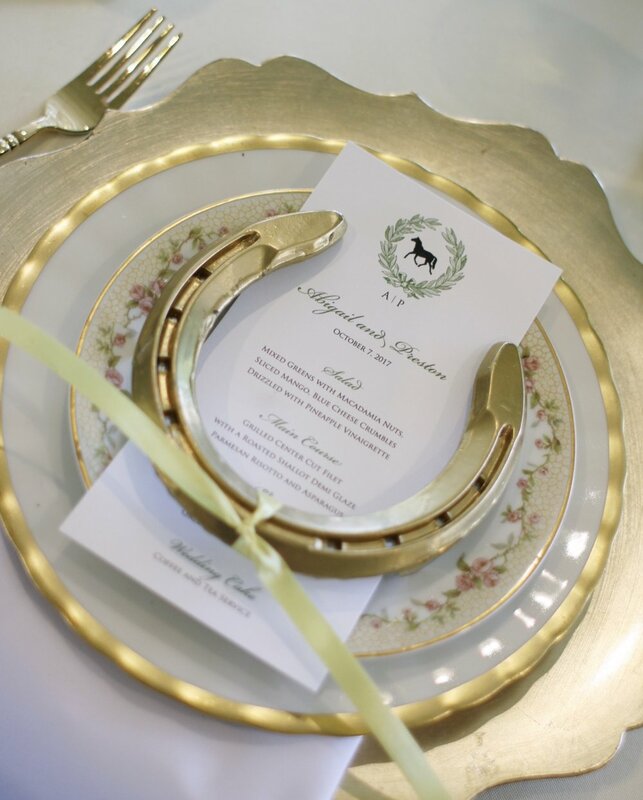 For the table setting I chose a simple white plate etched in gold and topped it with a floral salad dish. I always bring a large selection of goblets and stemware. I’m pleased I chose the light pink goblets with a stemmed wine glass and a champagne flute. It all worked so well together. Our darling blushing bride kept her “cool” as she dreamed of sunny beaches. She and her husband in real life were the perfect couple for this shoot. Their love shined beyond the clouds in the sky and added the much needed light to the pictures. Even the adorable horses at Horse Stamp Inn couldn’t contain themselves as they looked on, admired, and gave their nods of approval. This shoot conveyed “I’ve got sunshine on a cloudy day”. Donuts are trending at weddings, bridal showers, and at other events. Why wouldn't these little round wonders be trending? Donuts are pretty darn tasty and loved by both kids and adults. Donuts are awesome just on their own, but imagine a wall covered in them... That is out of this world amazing! Whether it's a sprinkled, powdered, or a glazed donut if you hang it on a wall surrounded by other donuts your guests are going to go crazy! I've been wanting to add a donut wall to my rental inventory for awhile now. I love everything about them! I've perused Pinterest for weeks getting ideas and thinking of ways to make my wall a little more unique and different from others I've seen. I found my perfect donut wall at a little junk store I frequent often. It was the perfect size and I liked that it could easily be used vertically and horizontally. Now that I had the wall I just needed something for the donuts to hang on. I bounced around a few ideas and tested one I really liked. I was a bit discouraged that the donut would not fit on the knobs I hoped to use, but I wasn't about to just give up! Where there's a donut there's a way and I had two dozen of them ready to be on a wall! The garbage can was full and as usual I was the one to empty it and walk the trash into the garage. Every time I walk into the garage I stop to admire my plates which usually leads to trying out new place settings etc... This day was no different! I was moving plates around and noticed a bag of wine corks that I'd been collecting for not yet known projects. That is when it hit me! The hole of a donut fits perfectly on a wine cork. I loved the idea of using wine corks to hang the donuts on. It would give the wall lots of character. My dear husband, bless him was so wonderful at executing my plans. He measured everything out and drew up the plans. He had the perfect idea on how to screw the wine corks onto the board in a way that the cork can easily be removed and replaced. So great! It did not take him long to get 48 corks on the wall ready for their donuts. It's a Boston Tea Party! I love a tea party, I love Halloween, and I love a clever play on words. So, just imagine my thrill when I had the chance to put all of those things together! When I heard our neighborhood was hosting a Halloween pet costume contest I jumped at the chance to enter my dog, Lincoln. Lincoln is our family's rescued Boston Terrier. As with most Boston Terriers he has a quirky personality, but we love him to pieces! As I thought about what costume would best suit Lincoln's personality a few ideas came to mind. I wasn't set on any of my original ideas and I knew I wanted a home made costume and something totally unique. Then the idea came to me! Tea party, Boston Terrier, Boston Tea Party! Perfection! My husband said he could easily make a tea table to attach to Lincoln's back. We decorated the table with cute fabric and a plastic children's tea set. It turned out super cute! Lincoln looked quite dapper in his bow tie wearing his costume. He was a hit at the costume contest! Lincoln typically balks at getting his picture taken, but he posed nicely that day for one good shot. It's always tea party time. I was thrilled when my first call for a wedding rental came in not too long after I had Dish It Out up and running. The call came from the mother of the bride. 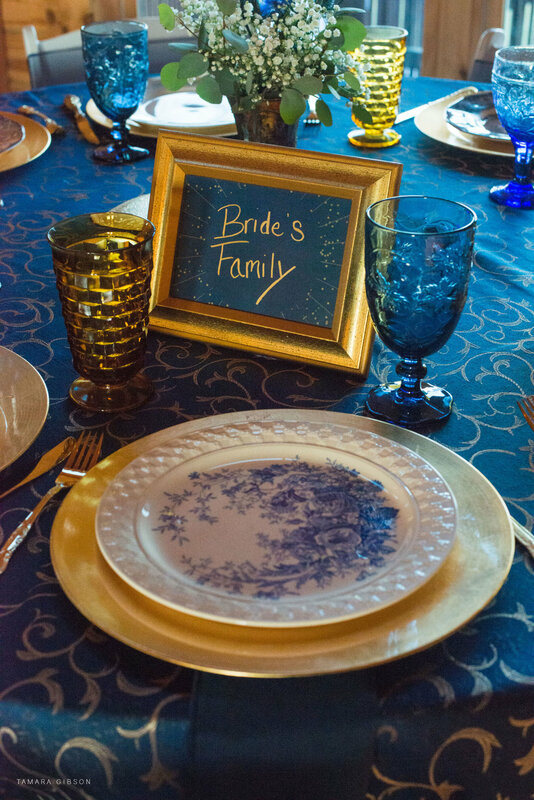 Her daughter had most of her wedding planned, and knew she wanted a vintage feel. 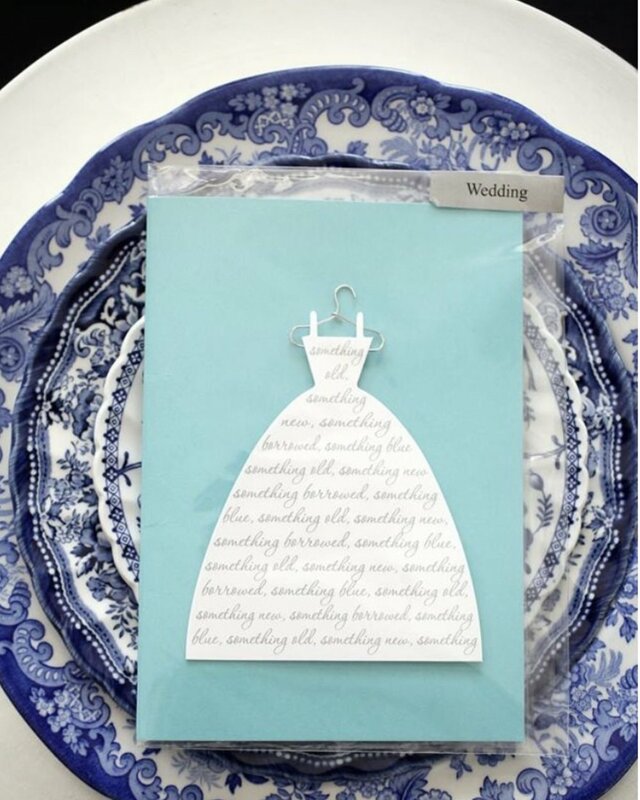 The bride spoke to her mom about wanting vintage plates for her reception tables. They weighed the options of buying vs. renting and knew renting was the better choice for them. I spoke with the bride and with her mother to get an idea of the look the bride wanted at her reception. 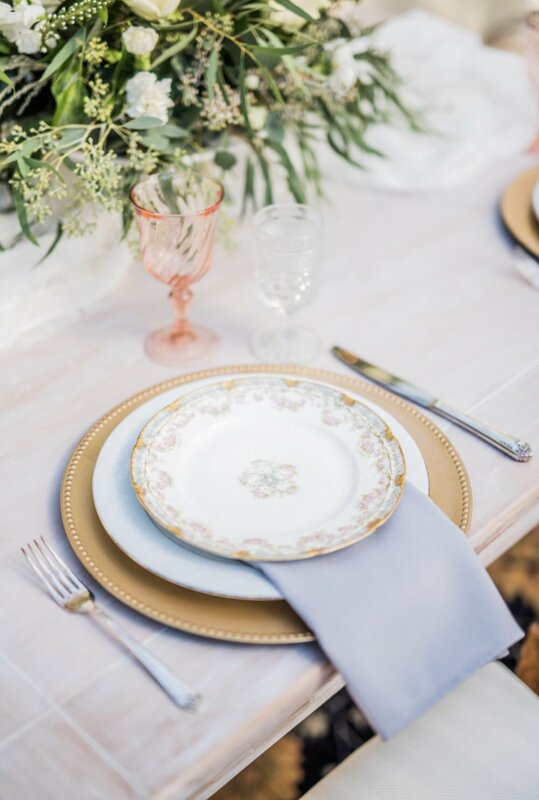 The sweet Southern bride wanted very vintage style plates and she liked florals. She was open to some mixes of blues and reds and swooned over plates with a scalloped edge. I just loved her! I had a great time hand selecting all 175 dinner plates for the bride. I pulled out lots of Limoges, Spode, Haviland, and some Noritake getting as many different patterns in, but sticking with the style the bride was hoping for. 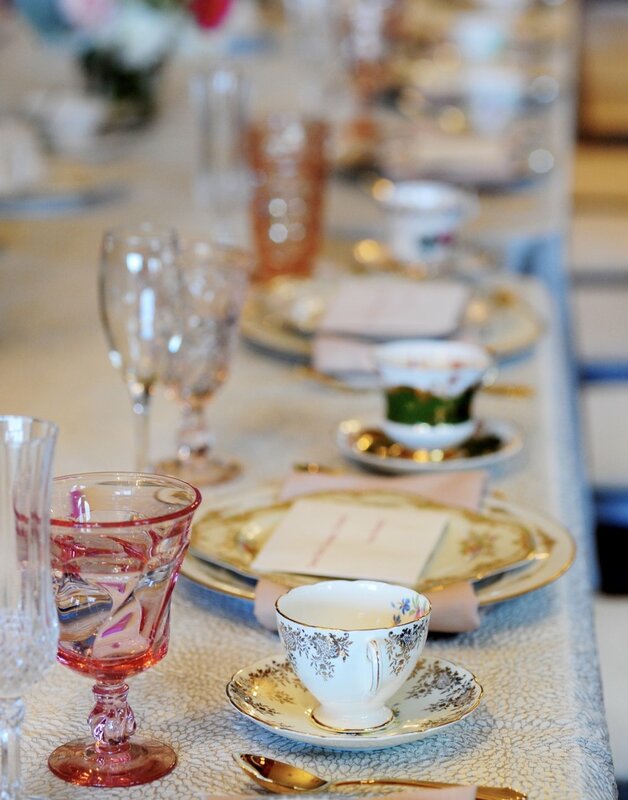 Two goblets and two Haviland moss rose scalloped edge plates were set apart for the Sweetheart table. Each plate was given a wipe down and carefully packed for a pick up. The bride and her mom came by to pick the plates up. I waved a good bye to the plates as they went off to grace the tables at The Ribault Club in Jacksonville, FL. I was over the moon when the mother of the bride sent me pictures of the reception tables. 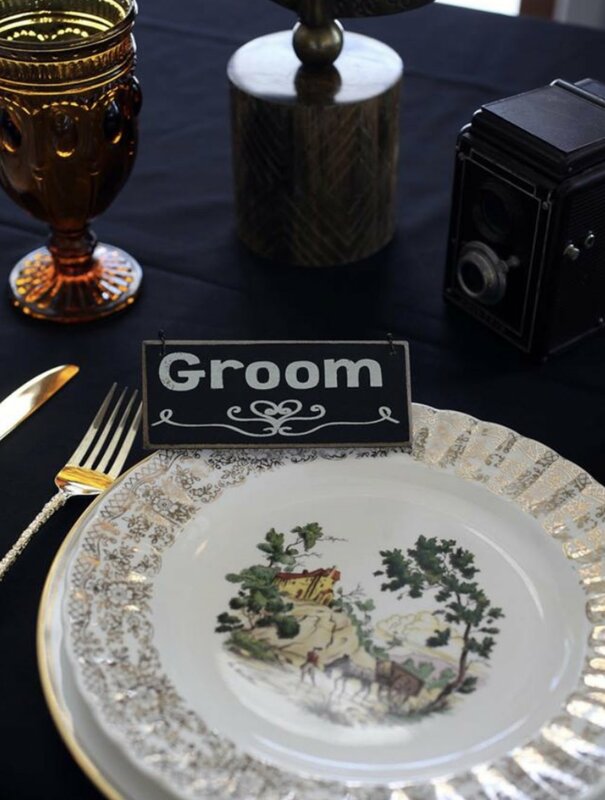 The plates looked amazing on the tables at The Ribault Club mixed in with the lovely florals of LDD Events. Loved being a part of this very special day!